Or rather, Nigella Lawson went there first in ‘Feast’, which is one of my favourite cook books. I think she conveys quite well the sort of feelings I have towards Valentine’s Day: she talks about her all-round cynicism (and it’s this darker side of Nigella which comes through in her writing that keeps me liking her) and then quite frankly also admits she’s been caught up in the whole affair. I may do all this business with a mix of light-hearted glee and very conscious knowing irony, but I still do it. I buy into a culture of consumption and expectation, etc. But isn’t that true of life in general nowadays? Valentine’s isn’t really much distinct from the overall fact that you’re encouraged to approach happiness as something that can be bought and that love can (and should) be ticked off on your to-do list of How To Be A Complete Human Being. Well, I guess there’s the chocolates and snogging. And, well, the baggage of narrow ideas surrounding romance qua romance. In essence, perhaps Valentine’s isn’t the intrinsic problem; it’s likely part of a larger malaise. This isn’t an impassioned defence of Valentine’s Day (for that, you could read this post on Mr. Pear’s blog), just jumbled thoughts. 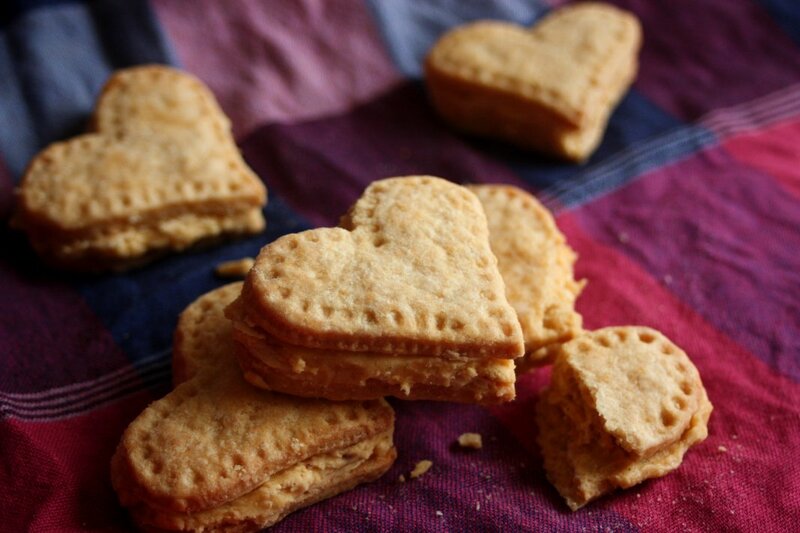 I mean, I think these biscuits are excellent in and of themselves – there’s the inclusion of Bird’s custard powder in both the biscuit and the filling, but it’s still a more subtle, buttery, vanilla-and-nutmeg scented version of the shop-bought kind. It’s the heart shape which takes them up to eleven; they look so absurdly cute that it verges on parody. But if this is still too saccharine for you, have some truly silly valentine hearts. I needle-felted them out of sheep’s wool, a romantic and sensuous method to rival that pottery wheel scene in ‘Ghost‘. Obviously. 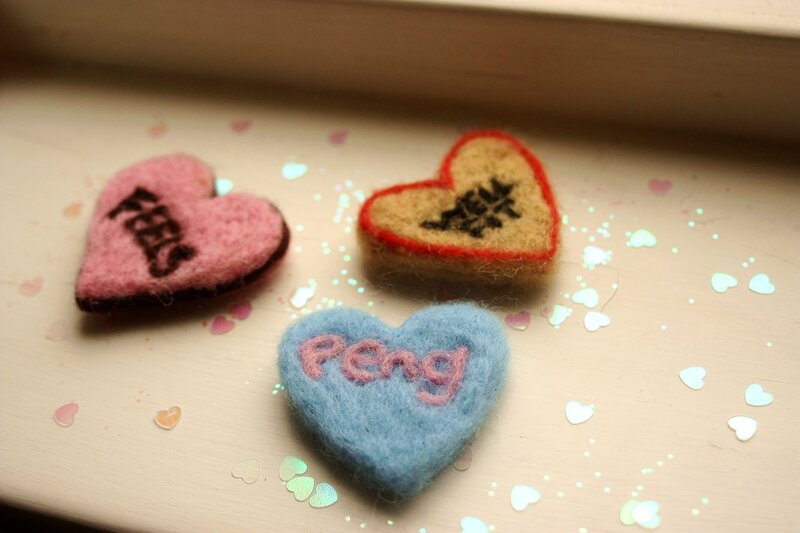 ‘Feels’, ‘Well Fit’, and ‘Peng’ are earnest words of love, you know. They are fragments of a Pablo Neruda poem. Honest. Keep in an airtight container at room temperature for about a week, but good luck with that. Mix the plain flour, custard powder, a few gratings of nutmeg, baking powder and salt in a large bowl. Add the cold, diced butter and cut it into the flour with a pastry blender until the mixture resembles fine breadcrumbs. Mix in the sugar. In a small bowl, combine the egg and milk. Add about half of this to the flour mixture, blending very well to get everything to cohere into a firm dough, adding more liquid only as needed. Pat the dough into a disc, wrap and refrigerate for at least 20 minutes until completely cold. When you’re ready to bake the biscuits, preheat the oven to 180 degrees Celsius. Line 2 large baking trays with paper. On a lightly flour-dusted surface, roll the cold dough out until it’s quite thin, about 4mm. Cut out your shapes with a 5cm cutter and gently place them onto baking tray a few centimetres apart (these biscuits won’t spread much). If you’ve the time, allow the scraps to rest in the fridge for 10 minutes before re-rolling. Make sure you’ve got enough to make the desired amount of sandwich biscuits. Also it is wise and indeed recommended to have maybe some spares for munching on. If you like, you can use a pointed implement to make an elegant dotted border around each biscuit. I used the narrow end of a chopstick. Bake the biscuits for 12 – 15 minutes, until they’re dry on top and just turning gold at the edges. They may still be a little soft but will firm up upon cooling, so set the trays on cooling racks until the biscuits are completely cold. In the meantime, make the filling. Mix the custard powder, a few gratings of fresh nutmeg, and icing sugar together in a bowl, making sure there are no lumps. Add the soft butter, vanilla extract, and hot water, beating very well with a wooden spoon or electric mixer until very creamy and light. Sandwich the biscuits with about 1 lightly rounded teaspoon of the filling, spreading right to the edges. If you’re giving these as gifts, you may want to leave the completed biscuits to set a little before transporting them. I generally come down on the side of the cynics. But if these biscuits are involved (heart-shaped or not), then I think I need to reconsider. Your biscuits are adorable, and it had never occurred to me that custard creams might contain actual custard in the biscuit. Awesome.